Al Awir plant ... awarded Lighting Project of the Year. Philips has showcased its prowess on numerous projects in the region both in indoor and outdoor applications, such as HOK’s offices in Dubai and the Sheikh Zayed Bridge in Abu Dhabi. Whether indoor or outdoor applications, commercial offices or supermarkets, Philips Lighting has provided solutions to several projects in the region, delivering energy efficiency, aesthetics and support at the same time. Among such projects in the UAE was a new office for a globally recognised architectural firm in the landmark Rolex Tower in Dubai, and the Sheikh Zayed Bridge in Abu Dhabi. When global architecture and urban planning firm HOK was moving to its new offices in the Rolex Tower its key objectives were sustainability, innovation and intelligent lighting and achieving a futuristic bright and open ambiance. HOK is also a pioneer in sustainable energy development and aimed to create aesthetically pleasing offices that meet the highest Leed (Leadership in Energy and Environmental Design) standards. In line with these requirements, the company had to be mindful of watts per sq ft when looking at lighting, both in terms of energy consumption and light output. “It’s not just the lighting level but also aesthetics. The lights needed to look futuristic and blend into the interiors – I almost didn’t want to see them. And the defined lighting criteria had to be met: it had to be intelligent and responsive,” says Sanjeev Coelho, senior associate, HOK. 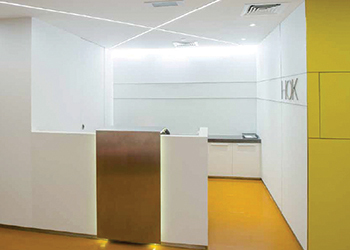 Philips’ LED lighting used in the reception area of HOK’s offices. Philips listened to HOK’s specific requirements and provided a range of options to fulfil the firm’s lux levels and ambience criteria. “We live and breathe sustainability and there was a burning desire to use energy-conscious lighting. Philips’ lighting solutions, and the integration with Dynalite controls, help us with this. The way the lights come on and off is so subtle that you don’t even notice it. It’s great,” Coelho says. Philips’ LED (light-emitting diode) lighting have been used in the offices along with Dynalite controls to match HOK’s vision of a futuristic, innovative and energy-conscious office. Philips’ first task was to work with HOK to completely renovate the reception area, which was dark as it was located next to the core of the tower. Coelho believes LED is the future of lighting and in line with this, Philips installed Colour Kinetics eW Fuse striplights to create a pattern that livened and brightened up the reception area. The addition of the IltiLuce Walksystem LED HP Opal lighting in the entrance, and the LuxSpace Accent Mini Adjustable lighting, combined with the natural light offered by the floor-to-ceiling glazing in the other parts of the building transformed what could have been a very dark and dull area into a bright, lively and welcoming space. In addition, the Dynalite system sensed when people entered and left areas, offices and meeting rooms and adjusted light levels accordingly. The numerous controls and sensors implemented as part of the Dynalite system meant that non-natural lighting was only used when required, for as long as required, adjusting and optimising light levels while minimising the need for architectural illumination. The results of HOK and Philips’ partnership is a bright, vibrant office that meets Leed standards, resulting in the HOK Dubai office being awarded with Leed Gold certification. Sheikh Zayed Bridge ... LED upgrade. 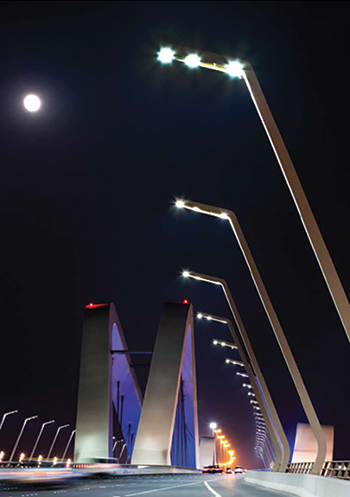 A key example of the deployment of Philips’ outdoor lighting systems is the Sheikh Zayed Bridge, where Abu Dhabi Municipality replaced the previous traditional HID metal halide system with the latest Philips LED luminaires. The lighting of the bridge presented several problems, including recurring faults and requiring lamp replacement, causing traffic disruption and road closures as well as large maintenance bills. In addition, the lighting was seen as inadequate, causing a safety issue. The major challenge was therefore to reduce maintenance and energy costs and to improve the light quality. The chosen solution was the Philips Luma LED luminaire, installed on the existing poles at 14-m height and, therefore, providing a simple, straightforward installation. A total of 186 Luma 1 LED luminaires were installed to achieve the required lighting levels and uniformity, and to meet all relevant lighting standards. The modular concept of Revoled within Luma 1 allows for the lighting scheme to be easily set up to meet the precise lighting requirements, enabling energy savings to be maximised. The lighting upgrade to LED has reduced energy consumption by more than 72 per cent compared with the previous installation, from 345,152 to 96,132 kWh per year – a massive annual carbon emission reduction of 133.7 tonnes towards Abu Dhabi’s sustainability target, says Philips Lighting. In addition, the LEDs have a guaranteed service life time of 50,000 hours (around 10 years) which means effectively that they last as long as the installation. There is, therefore, little or no need for repair or replacement, drastically reducing maintenance costs, it adds. Luma LEDs produce high-quality white light which improves visibility, a major contributor to road safety as it enables drivers to detect movement sooner and at a greater distance, giving them more time to stop. A spin-off benefit is provided by Luma’s constant lux circuit, which automatically increases LED current throughout its life to compensate for lumen depreciation. This not only stabilises light levels, but can save energy by avoiding over-lighting when the installation is new, according to Philips. Philips Lighting has also provided solutions in a number of unusual applications. For instance, Smartworld, an Etisalat and Dubai South joint venture company, has digitally transformed its headquarters with the help of Philips Lighting and the first Cisco Digital Ceiling framework deployment in the Middle East. The implementation brings together an advanced LED connected lighting system from Philips Lighting with Cisco’s secure IT network to enable Smartworld to deliver a more connected, comfortable and intelligent working environment for both employees and guests. Smartworld’s headquarters will be the showcase model of the company’s digital transformation and intelligent building capabilities for future developments in Dubai South, the UAE, and the broader region, says an official. By connecting Smartworld’s building services onto a single converged IP network, the Cisco Digital Ceiling delivers multiple benefits that include human-centric environments, optimised workspaces, streamlined maintenance, and reduced energy consumption and operating expenses. Cisco’s Digital Ceiling framework and solution sets accelerate digital transformation and extends the benefits of the IoT (Internet of Things) throughout Smartworld’s facilities, delivering a smart and highly connected environment that maximises efficiencies and optimises space utilisation. The energy-efficient Philips LED light fixtures are equipped with sensors that are connected to the Cisco Power over Ethernet (PoE) network. Real-time information provided by the lighting system, such as energy use and room occupancy data, help building managers to make informed business decisions, while workers can use their smartphones to adjust light levels and climate control. Yet another application is Philips’ first connected lighting indoor positioning retail project in the Middle East with UAE-based supermarkets chain aswaaq. The new system uses lights that act as a positioning system, which allows customers to use smartphones to access new location-based services. This empowers the retailer to provide a smooth shopping experience for its customers, which may help boost sales and customer loyalty. Working with Philips on the project is Aisle411, a US-based leader in digital store mapping. According to a Philips official, the system works by the individual light points transmitting their location through a modulation of light (a technology called Visible Light Communication) that is imperceptible to the human eye but detected by the customer’s smartphone camera. Once the customer downloads the retailer’s app they can choose to access location-based services, such as locate items on their shopping list to an accuracy of 30 cm. The data stream is one-way and no personal data is collected by the lighting system. By installing Philips LED-based indoor positioning technology in its Al Bada’a supermarket, Dubai, aswaaq will benefit from a 50 per cent reduction in lighting-based energy consumption, maintenance cost savings and a reduction in its carbon footprint. At the same time, aswaaq customers will benefit from navigating its aisles more easily and accessing new services via their smartphones. Meanwhile, Philips Lighting along with partner Etihad Energy Service Company (Esco) has won the ‘Industrial and Transport Lighting Project of the Year’ award at the Lux Awards Middle East, held at the Abu Dhabi National Exhibition Centre in April. 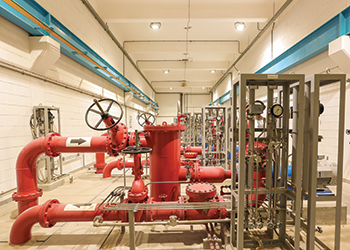 The award was for the retrofitting of Dubai Electricity and Water Authority’s (Dewa) power plants at Jebel Ali and Al Awir, which serve as the main source of electricity to the entire city. The award-winning project saw Philips deliver an efficient, sustainable, LED lighting system, including the replacement of 8,500 light fixtures, with the promise of delivering guaranteed energy savings.